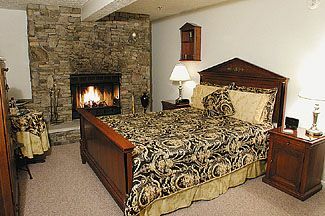 Our exceptional mountain lodge inn is beautifully appointed with attention to the details of comfort. The building is the former monastery of the Discalced (barefoot) Carmelite Fathers, who chose the site for it's natural beauty and tranquility. 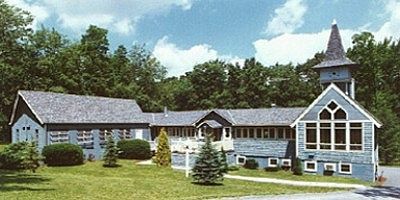 Completely renovated and tucked away on our own wooded two acres by the lake, the inn is in the heart of all Deep Creek Lake activities. At the Inn swim and fish our great dock - fishing poles provided. 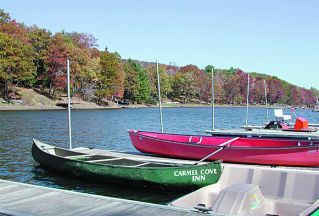 Take the Inn's canoes or paddleboat to explore Deep Creek Lake. Float away in our inner tubes on our sun-drenched cove of the lake. Play a set on our tennis court - equipment provided. Tackle some trails on the Inn's mountain bikes. Relax in our party sized hot tub. Complimentary cross-country and snowshoe equipment is available as well. Complimentary guest beverage bar with beer, wine, and assorted sodas. Various snacks served throughout the day and evening. Full sumptuous breakfast at private windowside tables. Huge Great Room with billards, fireplace, entertainment center with CD, Video and DVD library, and comprehensive guest information center. All rooms are air-conditioned, have private baths, state of the art flat panel LCD televisions with DVD, phones and robes, many with fireplaces, private deck, whirlpool bath, and breakfast room service. This and other Maryland Bed and Breakfast Inns can be found here online in The Register.